Smoothed antigenic profile of Sak in patients MEE (A), CLA (B), and BERDRI (C), as deduced from the amino acid sequences of negatively selected phage clones from a randomized Sak library. At each position (i) across the primary sequence, the mutation occurrence is calculated by adding the amino acid mutations from (i − 1) to (i + 2) in N selected sequences (where N is 14, 16, and 26 for the selection against MEE, CLA, and BERDRI, respectively). 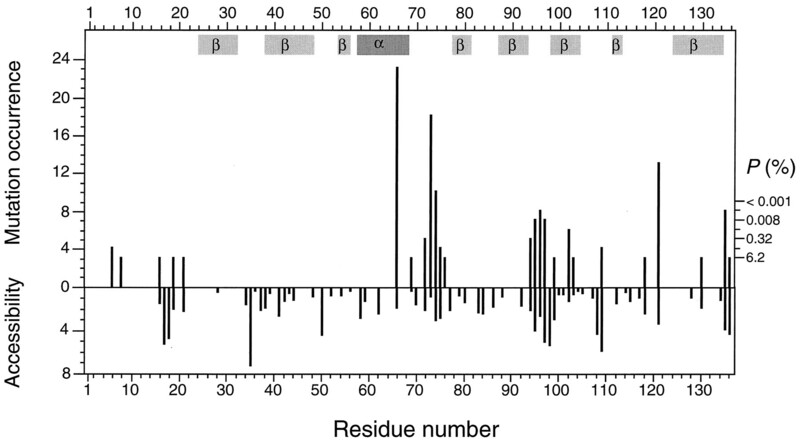 At peak values, the statistical significance is assessed by p, the probability whereby the number of selected amino acid substitutions in the four-amino-acid window could have arisen by chance. Smoothed antigenic profile of Sak in humans produced by adding all data from Figure 1 and using a four-amino-acid window across the primary sequence of Sak. The p values are calculated according to a total number of 56 selected Sak variants. Single-residue antigenic profile (upper part of the figure) and predicted surface accessibility (lower panel) on Sak produced by summing all data from Figure 1. Upper part, At each position (i) across the primary sequence, the mutation occurrence was calculated by adding the amino acid mutations in 56 selected sequences. The probability (p) in percentage is calculated according to a total number of 56 selected Sak variants. Secondary structure elements (α-helix and β-sheets) are indicated according to the crystallographic coordinates of Sak (25). Lower part, Surface accessibility to a 9 Å radius probe (mimicking an Ab-combining site) (26) calculated at each position (i) across the primary sequence of Sak. 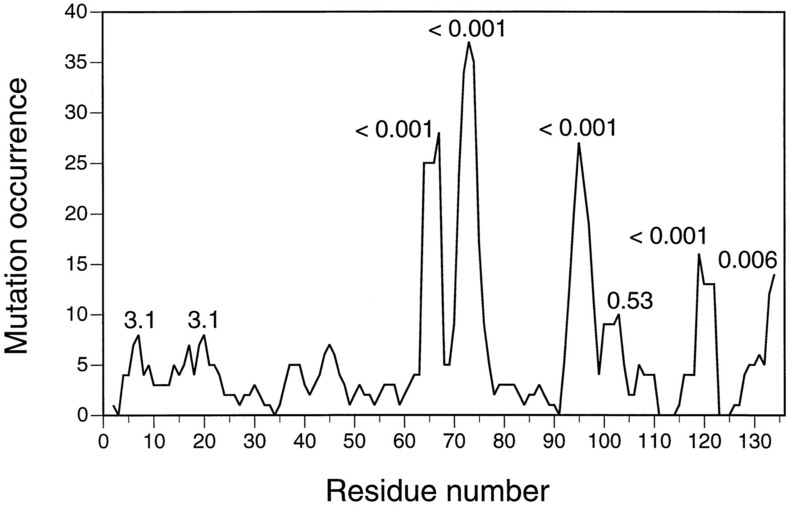 Spatial distribution of the antigenic residues on Sak according to the data of Figure 3. A surface-accessible area on Sak was calculated using a 1.4 Å radius probe and the crystallographic coordinates of Sak (25), and displayed using the software package GRASP (27). 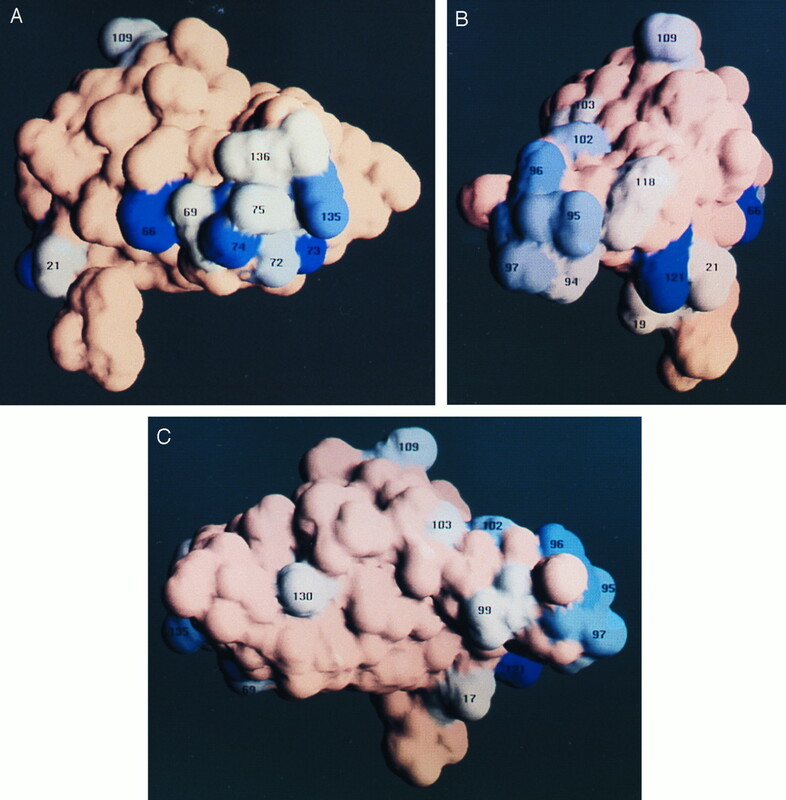 All 25 antigenic residues in humans are numbered and colored according to their antigenic importance (from white (p = 6.2%) to dark blue (p ≤ 0.01%) surfaces). The three pictures (A, B, and C) represent successive views of Sak while rotating along the vertical axis. 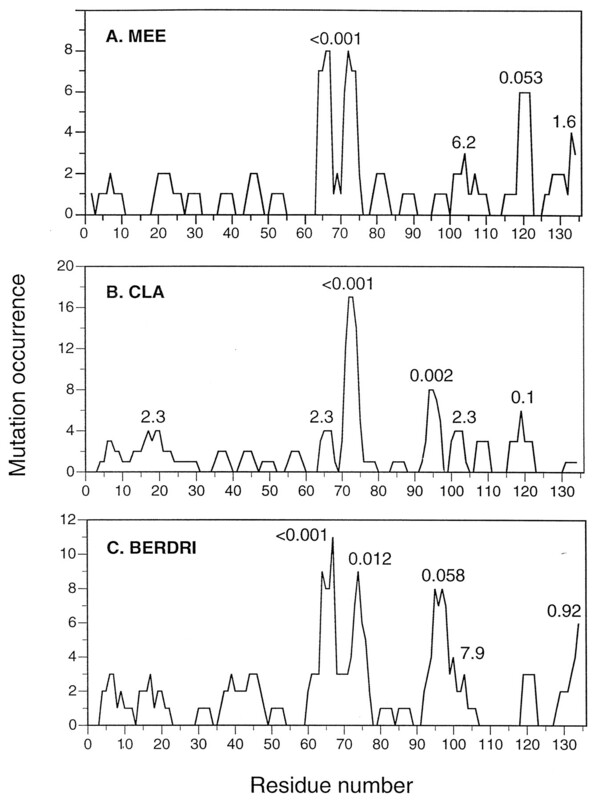 Antigenicity fingerprints of Sak in various patients. 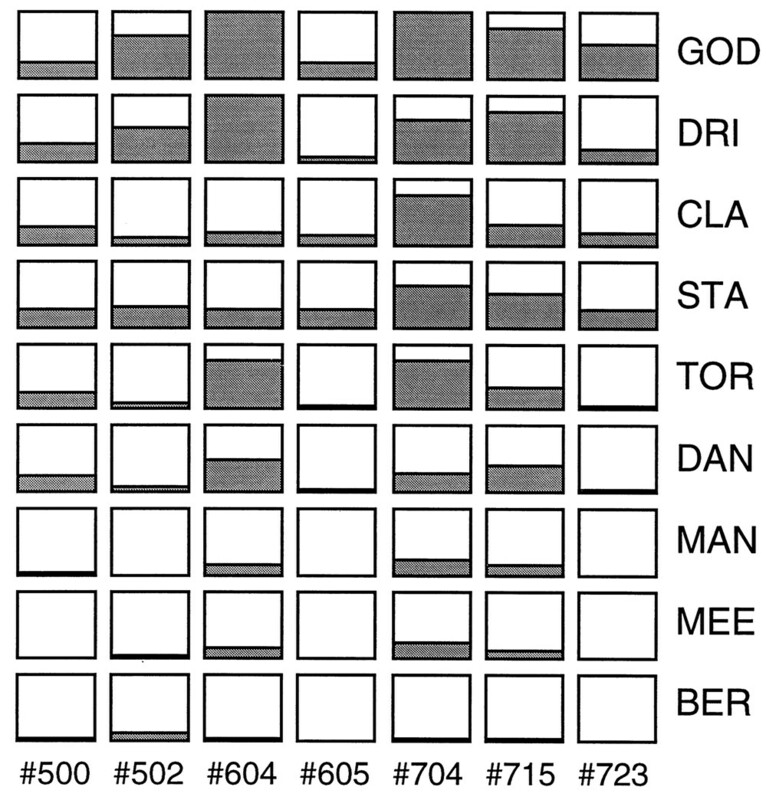 The ability of Sak variants selected against MEE (clones 500 and 502), CLA (clones 604 and 605), and BERDRI (clones 704, 715, and 723) to recognize nine patient-specific anti-Sak IgGs (GOD, DRI, CLA, STA, TOR, DAN, MAN, MEE, and BER) was determined by phage-ELISA and plotted according to their binding activity with respect to wild-type Sak. Gray squares represent full binding property, whereas white squares correspond to ≥100-fold reduced ELISA signals. The antigenicity fingerprints are grouped according to their similarities.